Thank Your Customers & More! Grow and retain your customers with a reminder program. *Free 60 day trial for first 5 customers to sign on with eligible software. 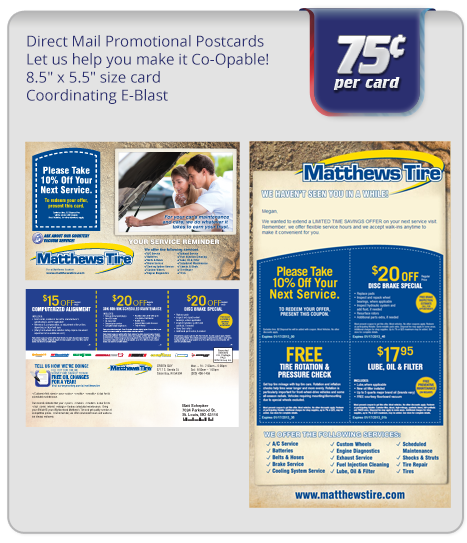 We send direct mail reminders twice a month with coordinating e-blasts. This price includes this program with an 8.5″ x 5.5″ card. We have smaller cards available. Stores should be using point of sale system that we work with. *Must be new reminder program client; dependent on POS capability. Our team consists of successful brand and project managers that will take the time to work closely with you on your company goals, customers and products in order to develop customized strategies and campaigns to achieve the highest return-on-investment. No matter which industry your company is in, you will find working with us for all your multi-media marketing needs is as convenient as if stepping right into your own backyard. We become a part of your team to help optimize your long term sales, marketing goals, and needs on a day-to-day basis. Our approach to our services and work ethic is that our client’s success is our number one goal.